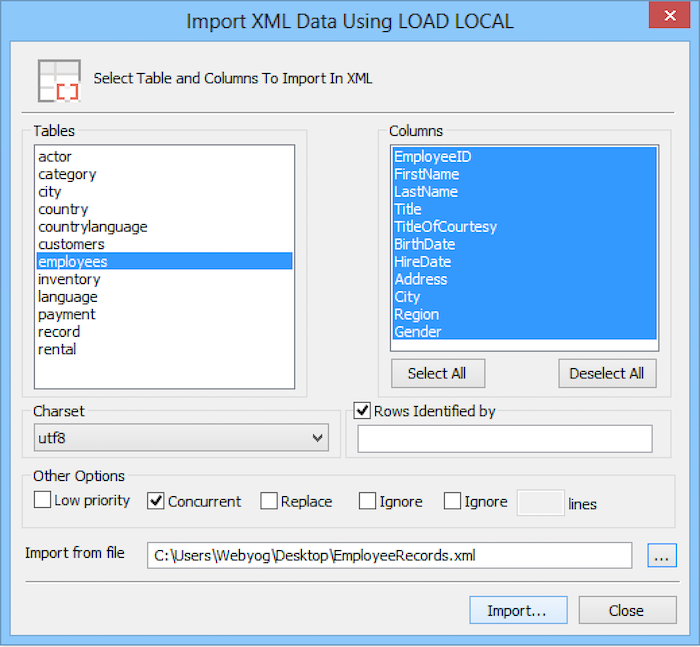 To import data from a XML file into a MySQL table, select the table in Object Browser and select Table -> Import -> Import XML Data Using Load Local... or(Ctrl+Shift+X). Tables: The list of all tables of the currently active database is shown. Select the Table from the list box. Columns: The list of all Columns of the selected Table is shown. Select the Columns for which the data to be imported from the File (you should be careful to specify the columns else you may get error or wrong result). Import from Files: Enter the name of the file (or click the … button to get File Selection dialogue box to create/select file) from which the data in XML format would be imported. Rows Identified by: Tag name given in rows identified by, is used for ROWS IDENTIFIED BY clause in LOAD XML statement. This tag name must be given without angle brackets (< and >) and will be used for identifying rows in XML file. Concurrent: the transfer job is carried along with other processes (which are not of high priority). Replace: Replaces the data in target MySQL table of same primary key value. Ignore: Skips the row of same primary key value in the MySQL target table. Ignore lines: Starts reading data in the XML file after skipping specified number of lines from the top in the XML file. Useful to skip header (or a bunch of records from the top).